Lawyers' Assistance Program will sponsor a 24-hour retreat for eating disorders and better health on Oct. 28-29 at The Center in Palos Park. The program will begin at 5 p.m. on Friday evening and end at 5 p.m. on Saturday and will focus on healty eating, compulsive eating and the causes for behaviors related to food. Speakers will include Dr. Kimberly Dennis, a Chicago-area psychiatrist who specializes in eating disorders; Judge Sheila Murphy, president of Lawyers' Assistance Program; Circuit Court Judge Allen Goldberg; Wheaton attorney Brigid Duffield and event chair CJ Muller of Palos Hills. Cost is $135 for single occupancy, $124 for double occupancy, and $65 for commuters. Space is limited. Contact Lawyers' Assistance Program at (312) 726-6607 to register or for more information. There has been a surge in prosecutions against citizens for recording public officials while those officials are performing public duties. The charge is a Class 1 felony for violating the Illinois Eavesdropping statute. You know the drill--a motorist is pulled over for a traffic stop, records the officer, the officer gets mad and arrests the motorist for violating the officer's right to privacy under the eavesdropping law. There is usually no underlying arrest against the motorist. Or, a homeowner records an arrest from his or her bedroom window and is arrested for a Class 1 felony for doing this. Earlier this year a downstate auto mechanic in Robinson, Illinois was charged in a five-count information for allegedly recording these public officials while they were conducting public business in a public place: the judge, the chief of police, a police officer, a circuit clerk, and the city attorney. William A. Sunderman of Charleston, Illinois represented the defendant pro bono. 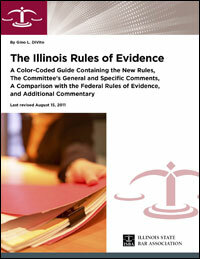 Don't be without this handy hard-copy version of Gino L. DiVito's color-coded analysis of the new Illinois Rules of Evidence, which is otherwise available only on the web. The guide compares the new Illinois rules with the FRE and provides insightful commentary. DiVito, a former appellate justice, is a member of the Special Supreme Court Committee on Illinois Evidence, the body that formulated the rules and presented them to the Illinois Supreme Court. The Illinois Supreme Court has announced today that Marcy L. Buick received most of the votes cast by the circuit judges in the Sixteenth Judicial Circuit and is declared to be appointed to the office of associate judge. Nursing home residents: no signature, no suit for nonpayment? That's the letter of the statute. Not surprisingly, though, not every admittee signs on the dotted line. "Sometimes signatures cannot practically be obtained prior to admittance," write Laura A. Elkayam and Lawrence J. Stark in the latest ISBA Health Care Law newsletter. Or sometime patients won't sign. Or the nursing home just fails to get the signature. So let's assume a patient who didn't sign, rang up a big tab and didn't pay. Is the nursing home left holding the bag because it failed to get the signature and thus didn't comply with the act? Yes and no, Elkayam and Stark write. They discuss a recent first district case holding that nursing homes can seek relief under quantum meruit but "public policy, as expressed by the Act, required dismissal of breach of contract claims predicated on these unsigned documents." Read their analysis of the case and the possible impact of a recent Illinois Supreme Court decision. Read more or comment about Nursing home residents: no signature, no suit for nonpayment? The Circuit Judges of the 18th Judicial Circuit, DuPage County, unanimously elected Judge John T. Elsner to the position of Chief Judge. Judge Elsner's term as Chief Judge will commence on Dec. 5, 2011. He succeeds Chief Judge Stephen J. Culliton. John T. Elsner is a graduate of Lewis University College of Law. He was appointed as an associate judge in 1991 and was elected a Circuit Judge in 2000. Prior to his selection as Chief Judge, he had served in teh Law, Domestic Relations and Criminal divisions of the 18th Judicial Circuit Court. The Illinois Supreme Court has announced that the Twelfth Judicial Circuit judges voted to select Victoria M. Kennison as an associate judge of the Twelfth Judicial Circuit. Ms. Kennison received her undergraduate degree in 1991 from Illinois State University and her Juris Doctor in 1996 from John Marshall Law School. 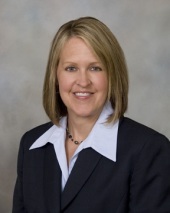 Ms. Kennison is currently affiliated with the Law Offices of Edward R. Jaquays in Joliet. Q. I am a solo practitioner located in the Chicago suburbs. I have one staff member. I am 53 and have been practicing law for over 25 years. I try to limit my practice to estate planning and estate administration. However, I do have to take on other general practice type matters to stay busy. Practicing law by myself is beginning to take its toll on me - it gets lonely practicing alone, coverage and backup for clients is difficult, and I have the full burden of the worry 24/7. What do I do with the practice when I get older and reach retirement age? I have not taken a vacation in years. I have been thinking about the pros and cons of joining another firm? What are your thoughts? A. One option would be to grow your practice internally. You could add a younger associate attorney. However, it sounds like you currently don't have the business that would support the position. Then you would have to train the mentor the assoicate and pray that once they become productive - two or three years down the road that they stay with you and don't leave for greener pastures. Another option would be to bring in a more senior lateral attorney with experience and a book of business. A third option would be to look around for another solo or small firm that is looking for someone to carry the firm into the next generation as a part of their succession strategy. Get your business essentials—reliable computing in a sleek design. CALL: (888) 202-4465 and mention STBAR. For details on this offer and other specials for ISBA members, plus FREE U.S. Ground shipping, visit www.hp.com/go/statebar.